Next year marks 20 years of me living in the USA and yet in all that time I never really understood the point of Thanksgiving. Perhaps it’s because growing up in Bosnia meant that every Sunday was the mandatory family dinner so I couldn’t really grasp why doing something so ordinary was worth all the fuss. Not to mention that, being the oldest and a girl, at these dinners I had to both help in the kitchen and supervise my younger cousins, two of my least favorite activities, and so any mention of large family gatherings immediately puts me en garde. This year, however, I started thinking about the actual word Thanksgiving, and realized that perhaps the holiday itself is not about obligatory dinners and foods I dislike, but about giving thanks. For everything that happened this year and all the people who might have contributed to it. Good or bad, it all helped bring us where we are now, and I for one am truly thankful for it. One of these truly wonderful experiences has to do with Gregory Crewdson. A year ago I was one of the many fans who attended a screening of his documentary, nervous beyond belief when meeting him afterwards. Fast forward to a year later, almost to the day, and I wake up to an email from Crewdson personally inviting me to the signing of his newest book. I kept pinching myself all week, the grin of disbelief never leaving my face. 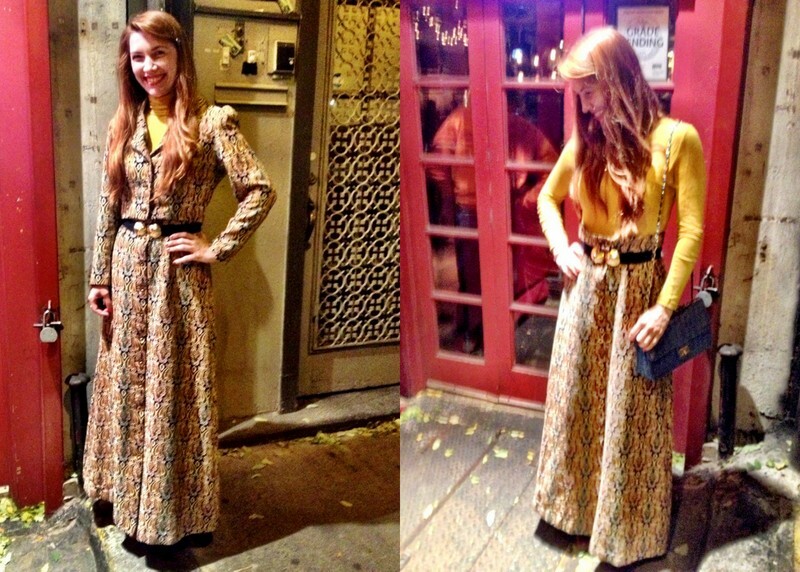 On the night of the signing I pulled out one of my newest purchases – the vintage skirt-suit by Miss Pat that reminded me of the Crewdson esthetic with its 70’s upholstery pattern. The skirt came with a black belt, but I thought pairing it with something more fun would serve it better, and opted for the vintage navy & gold belt I found in the same Florida store as the suit. After a few different tops I finally settled on the mustard-yellow turtleneck from H&M which complimented the colors of the suit nicely whether worn under the jacket or without it. I completed the outfit with my red Miz Mooz booties and the blue Chanel-like chain purse. Feeling very artsy I made my way to the Gagosian Gallery where I was greeted by a long line of fans waiting for their turn with Crewdson. I joined them, thinking how bizarre it is to be in the same exact position two years in a row – waiting in line to meet one of my favorite artists of all time. Except that this time he lit up and broke into a huge smile, giving me a big hug when I finally reached him. What a difference a year makes! So for that and all other things that made my life richer and happier this year, I offer my deepest thanks. To my friends, my family, and life in general. I am truly and honestly grateful for having you. Happy thanks-giving everyone!